What kind of emotions do you feel when sighting a deer? If you have ever had your garden ravaged and chewed to a stub, you may know what true frustration is, and you will also understand where our much used phrase “oh dear” comes from! Why are deer more of a threat to our gardens today? Silicon Valley used to be an orchard, but now if you want to grow a single plum tree, you will need to put a cage around it if it is growing in deer territory. Deer resistance is relative: it depends on the time of year, on what else is growing in the area, and on the particular preferences of your deer. Deer and man have coexisted for a very long time. The native Californians actually used to help the deer by burning the land to create fresh new growth, high in protein, which the deer love. 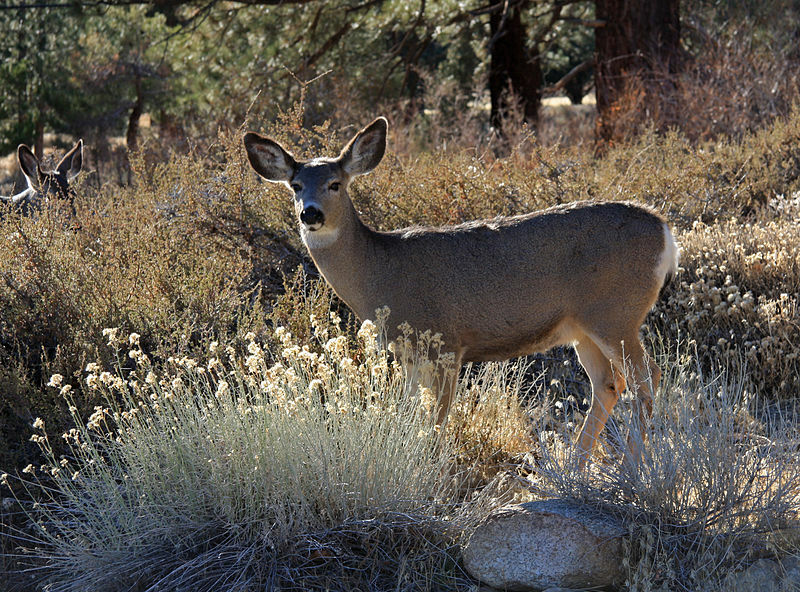 Deer were plentiful until the gold rush of 1849 which caused a massive deer depopulation. The miners not only cleared a large part of the deer habitat, but they also over hunted them for food and hides. This led to the first law made to protect deer, created in 1907, which required you to have a license to hunt. Meanwhile their predators continued to be hunted: grizzly and black bears, wolves, mountain lions. Deer proliferated with protection and even survived more loss of their habitat due to the postwar construction boom. They have adapted by moving into domestic gardens and now it is we who must adapt. There is no such thing as a deer resistant plant; you cannot reliably predict the dietary habits of deer. Much contradictory information exists on what deer do and don’t like to eat and gardeners often disagree on this subject. What is on one person’s list as a highly resistant plant is on another’s as a deer’s favorite. Deer resistance is relative: it depends on the time of year, on what else is growing in the area, and on the particular preferences of your deer. Appetites vary according to different areas. Although they are creatures of habit, and will frequent the same paths, day after day, they are also capricious in their choice of delicacies and just when you think you have worked it all out they will change their minds. Nevertheless, there are some general rules of thumb that may be helpful. Deer usually don’t go for tough leathery leaves — they prefer soft and tender new growth. They don’t like prickling their noses on spiny plants, nor do they like eating fuzz. They don’t tend to eat plants with aromatic oils in their leaves; these are likely to have strong flavors. They also avoid poisonous plants, particularly members of the Solanaceae (Nightshade) family. And, although a particular plant species is not touched on the majority of the landscape, it is likely to be munched on when it is growing alongside their favorite walk. In the late summer, when the rest of their world has dried up, deer are particularly hungry and thirsty; now they will be less choosy and will eat almost anything with some moisture in its leaves. At this time, an irrigated and fertilized plant, especially one straight from the nursery, will be irresistible. They are searching for water and even the tiny amount in a bird bath is enough to encourage them to your garden. Fallen apples, which they adore, will also attract them. Whilst they are there, they are more likely to see what else there is to eat. One of our showiest natives, Fuchsia flowered gooseberry (Ribes speciosum) bears a wicked armor of thorns along its branches and the fruit are strikingly spiky. The spiny arching branches are covered in inch long, dangling cherry red blossoms from January through April, making it a superb hummingbird plant. Deciduous in summer, leaves appear with the onset of rains and it blooms by New Year’s. It grows to about 3’ tall and 6’ wide and prefers partial shade in hottest climates. California barberry (Berberis pinnata) has handsome shiny crinkly spiny evergreen leaves which flush with color at its tips. Growing to 4’ to 5’ high and wide, it likes part shade best. Yellow flowers appear in spring and are followed with dark blue berries. 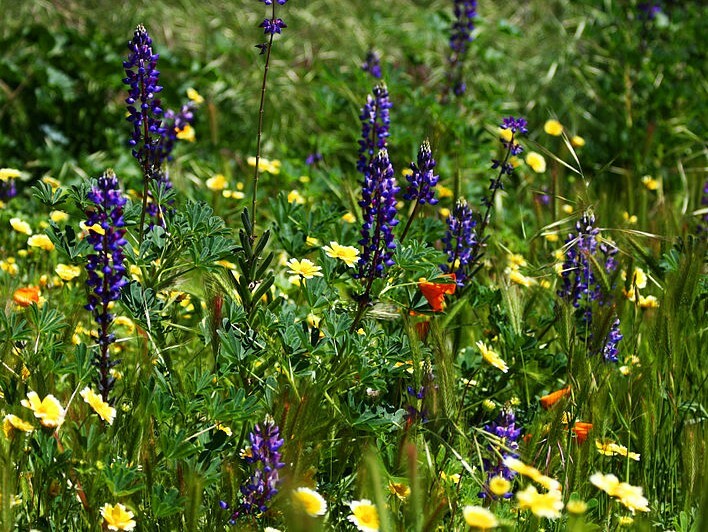 Sages (Salvia sp) offer several durable and drought tolerant floriferous species which mostly like full sun and good drainage. They have a resinous aromatic quality to the leaves which smell wonderful to us but not to the deer. These substances in their leaves (terpines and alkaloids) are actually intensified when the plant grows in hot dry soil, one reason to cut down on the watering. California bush anenome (Carpenteria californica) is an attractive formal looking shrub with narrow dark green evergreen leaves that offset an arresting floral display in late spring. Growing slowly to 4’ to 6’ tall and wide, it prefers some shade in the hottest parts. Manzanitas (Arctostaphylos sp) evoke the chaparral, and love hot dry sites. They include a huge range of beautiful species which have tough leathery leaves. Treelike forms such as Big berry manzanita (Arctostaphylos glauca), which eventually reaches 20’ tall, show off sinuously sensuous mahogany colored trunks, whilst ground cover forms such as emerald carpet (A. uva-ursi X nummularia) form neat dense mats that hug the ground and smother weeds. An adaptable and very reliable shrub form is the vine hill manzanita (Arctostaphylos densiflora ‘Howard McMinn’) which reaches 3’ high (it can reach 6’with age) and is wider in width. Most plants in this group like full sun best and they do request good drainage. All species in this genus light up the winter months with numerous tiny lantern like flowers humming with bee song. 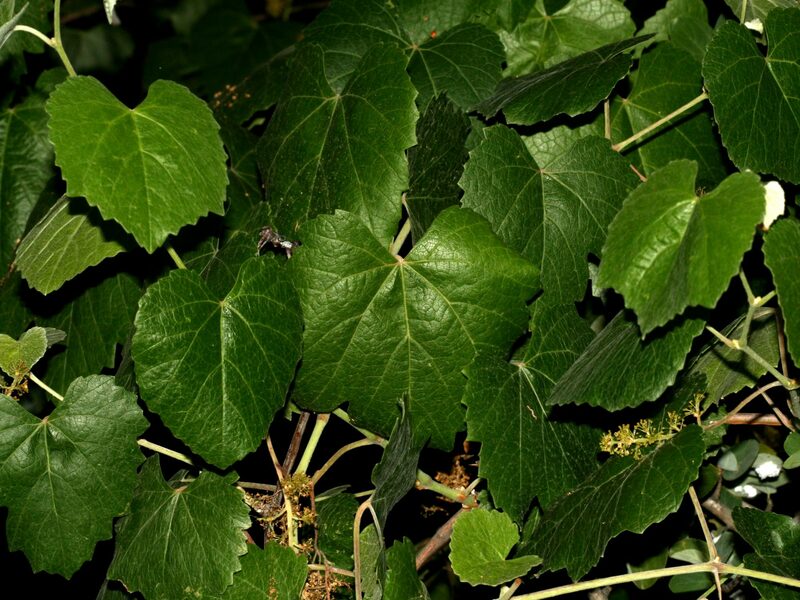 California wild grape (Vitis californica) is a deciduous rampant vine that has appealing lush leaves; however, it survives some munching as it grows so quickly it is soon out of reach. It also regenerates itself rapidly. The variety Roger’s Red (V. californica X vinifera) turns a blaze of red in the fall, and juicy grapes attract the birds. 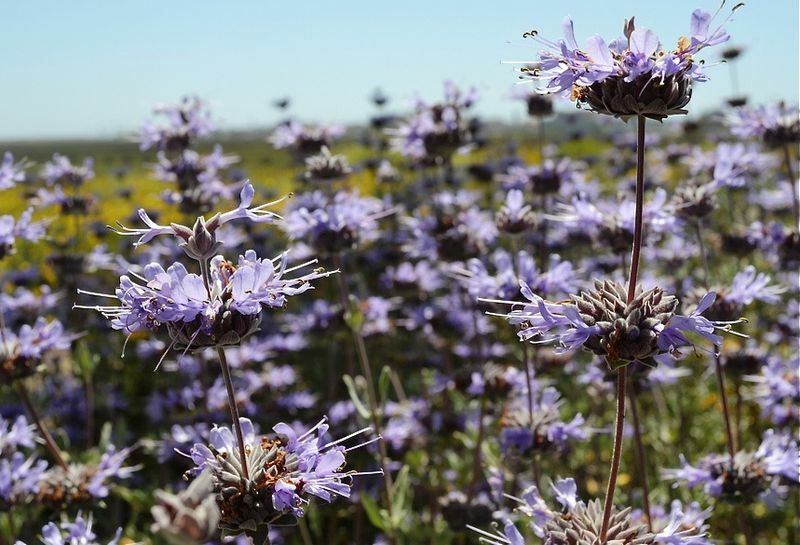 Spring wildflowers are relatively safe from deer because they are so numerous and appear when the world is a smorgasbord of new green growth; deer prefer grass (as the Native Californians knew). 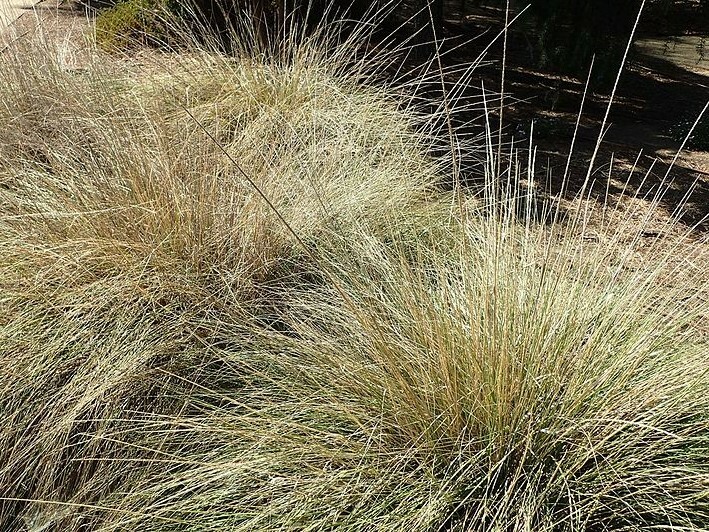 Deer grass (Muhlenbergia rigens) is so called not because deer like to eat it, but because it grows in their prime habitat: the dry chaparral. A dense mound of green foliage, the flower stalks turn a tawny gold in the summer. This is not interesting to deer but a graceful plant to use in full sun; it melds a planting and blends well with other plants. Armed with an understanding of your deer’s particular preferences and with knowledge of appropriate plants, you can have a gorgeous garden and may even learn to enjoy these elegant animals. Melanie Hopper is the owner of Sustaining Landscapes, a design company based in the greater Bay Area. Are the Carpenteria and the Vitis good with oaks? Hi Jon. On calscape.org, you can see suggested companion plants on each plant’s profile. Vitis and Carpenteria grow well together, and both have Quercus listed as companion plants. Vitis with Quercus agrifolia and Carpenteria with Quercus wislizeni.